QUANT IX SOFTWARE, Inc. is pleased to announce the release of Investment Account Manager 3 for Individual use. We're confident you'll find the new IAMv3 Individual version our best release yet, filled with new features and improvements, including suggestions from users such as yourself. Follow these steps for downloading a demo of IAMv3. Download the new IAMv3 demo. Once downloaded, install the new IAMv3 demo, using the default locations as provided during the installation process. Once installed, start the IAMv3 demo. 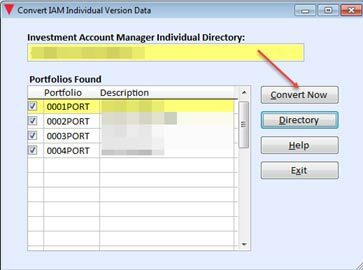 Select the file menu | convert IAM2 Individual into IAM3 Individual. 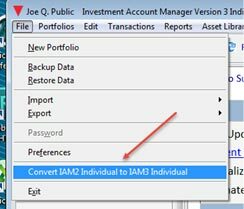 Select the OK button when prompted to continue with the conversion of your IAMv2 individual data into IAMv3 Individual version. If you used the original default location for your IAMv2 installation, your portfolios should be listed for conversion. Select the 'Convert Now' button. Note: If you did not use the original default location for IAMv2, use the 'Directory' button to locate the installation directory for your current copy of IAMv2, and then select the \Data folder. Your portfolios should be listed for conversion. Select the 'Convert Now' button. All existing portfolio data will be migrated to IAMv3. Thank you for your continued use of Investment Account Manager. We appreciate you as a customer, and are confident you'll find IAMv3 Individual version even more helpful in successfully managing your investment portfolio(s). If you have any questions, please contact our technical support team at: 262-241-3990. Email: techsupport@investmentaccountmanager.com.